I think most financial experts will tell you that 90% of success with money is really just behavior. You can make very little and leave something for the next generation if you are very wise about your spending and how you invest. Even my previous posts (here and here) were nothing about financial strategies but more about your overall outlook on life. I heard this quote recently and it kind of wrecked me. 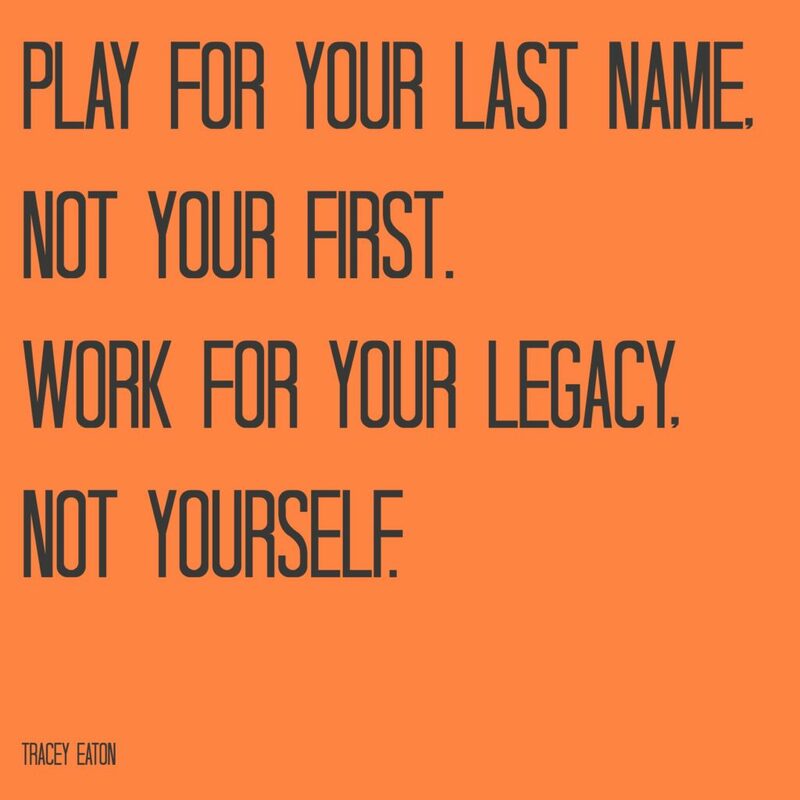 Really, this quote about legacy could apply to more than just finances- it’s something great to consider when looking at our relationships as parents, grandparents, spouses, and friends. Do I always play for my last name? No. I can think of times as a parent especially when I have just completely become unglued because of the selflessness that is required. Instead of considering the legacy I am leaving to my children, I many times can’t see past the circumstances of each day! We need to value our long-term, not short-term results. We have so been there, too! I already told you about our first year of marriage when we had $40 in our account and literally drove as fast as we could to Applebees because payday was tomorrow- TIME TO CELEBRATE. Haha. I want to make the tough choices and budget well so that my kids don’t have to worry about if the finances are there to put me into the nursing home, or get me a home health aide. I don’t want them to hear us have fights about our bank account balance. I know I talk about Dave Ramsey like he is my bff, but I just finished reading The Legacy Journey (which comes highly recommended, by the way), He says, “Your kids are watching you. If they see you budgeting, saving, working, and giving, then that’s what they’ll most likely do. If they see you stress out about money, buy big things on impulse, go into debt for purchases, and never give a dime to anyone, then that’s what they’ll probably do.” Ouch! Even if you don’t have children- do you want your nieces and nephews to do what you do? Do you want your legacy to be one full of stress and debt and a closed fist? I don’t. I want to play for my last name. I want the Yoders to be remembered as cheerful givers and smart savers. I want to stop worrying about only my wants and my desires so that we can impact our children, our friends, and God’s kingdom for years to come. When you read this quote- what do you think of- Your finances? Maybe your parenting? Or even your faith? I’d love to hear.